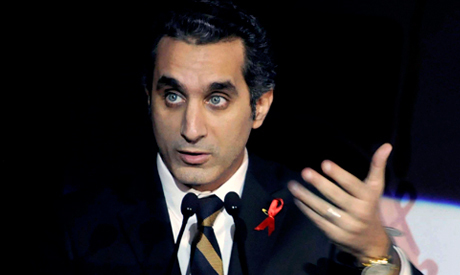 Bassem Youssef made his first televised appearance on Wednesday, nearly a month after his hit show "El-Bernameg" was cancelled by host channel CBC. Appearing on the popular talk show "Akher Kalam," which is broadcast on private satellite channel ONTV, Youssef gave host Yosri Fouda a behind-the-scenes glimpse at the events surrounding the show's cancellation. Calm, and with his usual sharp wit, Youssef said that he didn't believe the authorities were responsible for his program's termination. Similarly, he said he believed the claims from the government of ousted President Mohamed Morsi, who also insisted that it had nothing to do with him being referred to the general prosecution shortly before the events of 30 June. "I always give people the benefit of the doubt," he said. CBC, he said, however, makes the government look bad, as though they had a hand in what happened. Fouda read the two statements that CBC had issued last month concerning the cancellation of "El-Bernameg." The first declared that the channel was not responsible for Youssef’s statements and that Egyptians felt offended over his “insults of Egyptian symbols." Youssef responded that if CBC had not liked his show, then the station should have just gone ahead and pulled it. There was no need, he joked, to remark that Egyptians had been offended, especially since no one went out to the streets and conducted a survey of people's feelings. Furthermore, the only Egyptian symbols he knew of were the Egyptian flag and the national anthem, and as far as he was concerned, he had never made fun of them. He added that it had been a goal of the revolution to eliminate the kind of language used in CBC's statement. The second statement declared that the channel had editorial and contractual issues with Youssef, meaning that he did not deliver the number of agreed-upon episodes. Youssef explained that he did indeed deliver the last contracted episode, but that the channel chose not to broadcast it. He further explained that he had signed a contract making him solely responsible for all of the content on his show, so that CBC and his program's staff could not be prosecuted. Youssef regaled Fouda with an account of his recent trip to New York City, where he was presented with an International Press Freedom Award from the Committee to Protect Journalists (CPJ). He said he was pained at the award ceremony when people expressed their astonishment that the current interim government in Egypt has less of a sense of humour than that of the Muslim Brotherhood. The current regime does not look good abroad, he said. It seems frail because it cannot tolerate a satirical weekly show. In yet unaired footage from the award ceremony, Youssef said that for some reason his jokes pissed people off, even though those same people had been laughing at them only months ago. Regarding future broadcasting plans, Yossuf said that his credibility would be affected if he returned to CBC. He confirmed that he is in talks with German TV channel Deutsche Welle (DW), along with several other channels both Egyptian and foreign. However, nothing can be settled, he said, until he determines if legalities with CBC will prevent him from appearing elsewhere. Despite being offered complete freedom of expression from Deutsche Welle, he said that he is uneasy about appearing on a foreign channel not broadcast in Egypt. "I want to work from Egypt to prove that change has occurred here and that there is more space for freedom of expression," he said. On the speculation that Defence Minister Abdel Fattah El-Sisi might run for president, Youssef said “anyone we agree can run for presidency.” However, he said he hopes El-Sisi doesn’t and simply stick to his initial position against army meddling in politics as it would "set Egypt 40 years backward." Bassen you are exactly right. All those who were laughing at your jokes are no longer laughing. Egypt is trying to recover and stabalize from its internal enemy the brotherhood that is still out of control vandalizing Egypt. Untill the last Muslim brotherhood is rounded up, or exterminated, peace and security restored, I can't imagin too many decent regular Egyptians are in the mood to laugh with you, and enjoy your humor. Egypt needs the likes of Gen. El Sisi to restore law and order, before Egyptians can start laughing with you again. Whatever you may think about Bassem,he is not a hypercritical person neither is he scared to speak his mind, as he really believes in 'freedom of speech' and practices it, unlike others who just talk about it. Baseem is an Egyptian ahead of his time, one day there will be many Baseems, he is in my mind a pioneer!